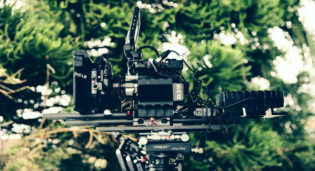 Webinars and live streaming videos have quickly become one of the key tactics top B2B and B2C brands use in their communication strategies. This isn’t a surprise. Webinars are just as effective for generating new leads as they are for building relationships with your existing customers. So how can you make webinars work well for you? Step 1: promote them the well! Webinars – where do you start? Most of us couldn’t host the Oscars just right off the bat. Then again, after this year’s epic mix-up, I’m not sure you’d want that privilege anyway. 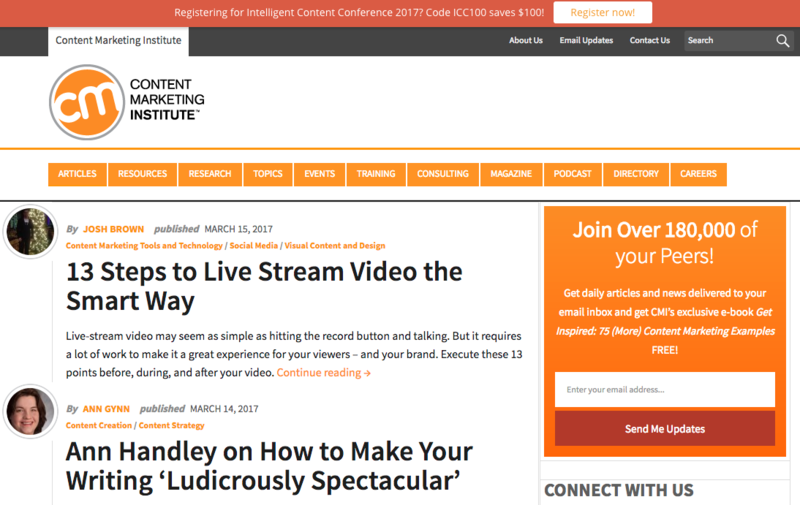 Great webinars, just like any other events, require planning. That’s why we’ve previously written these two articles on how to create your first webinar and how to structure your webinar content the right way. But don’t be misled – planning isn’t everything. You can prepare the most inspiring presentation, have the narrating skills of Morgan Freeman, and still get little to no ROI if there’s no one to hear you speak. Getting your virtual seats packed is crucial to making your webinars effective. 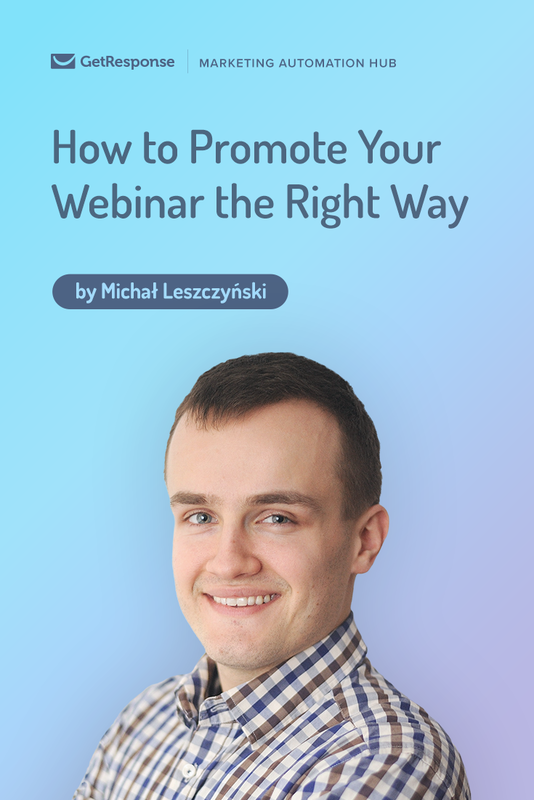 That’s why I’ve prepared these 6 tips on how to promote your webinar the right way. Oh, and you guessed it – marketing automation plays a big part in it. 1. Build a killer landing page. First things first. If you want webinars to help you generate leads, you can’t go without a landing page. This is where you’ll be directing all your traffic and where they’ll be able to register for the event. If your page isn’t effective, you’ll be wasting your efforts and, of course, your budget. But what makes a landing page effective? There’s no single answer to this question. It’s how you communicate the Unique Selling Proposition (USP), the wording of your headline, the supporting headline, use of social proof, and so on. You can learn more about these elements in this practical article written by Pam Neely – Anatomy of a Killer Landing Page. Or you can join the Essential Landing Page Course and learn more about landing pages, one email at a time. 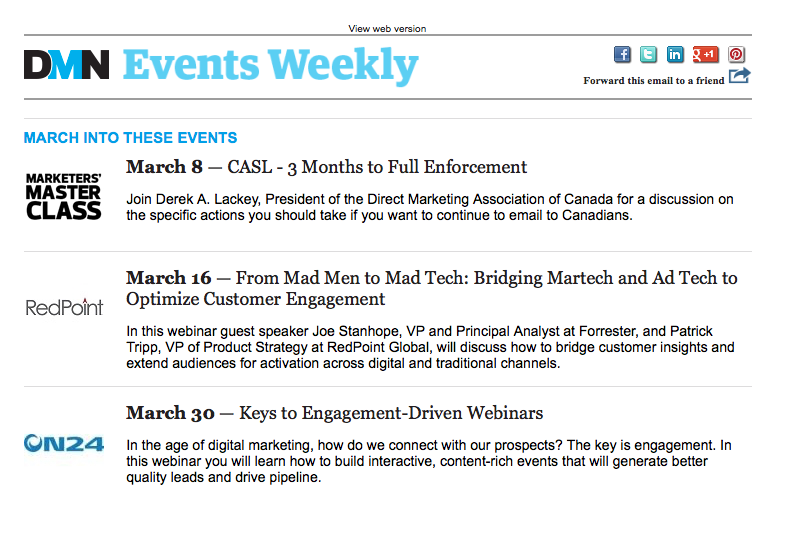 Below you’ll see an example of a landing page we’ve used to promote one of our past webinars. Having read the above article, you’ll quickly recognize the tactics we’ve used when designing it. 2. Set up automation workflows. If you haven’t paid much attention to marketing automation, now’s your time to change that. Automated workflows can be great help both when promoting your webinars – while trying to get as many attendees as possible – as well as when you’ll be following up with them, after the event has already taken place. How: List all the benefits and key takeaways the webinar registrants will get from attending the event. And if you’re not planning to record the presentation, tell them so. It will motivate them to turn up on the specified date. 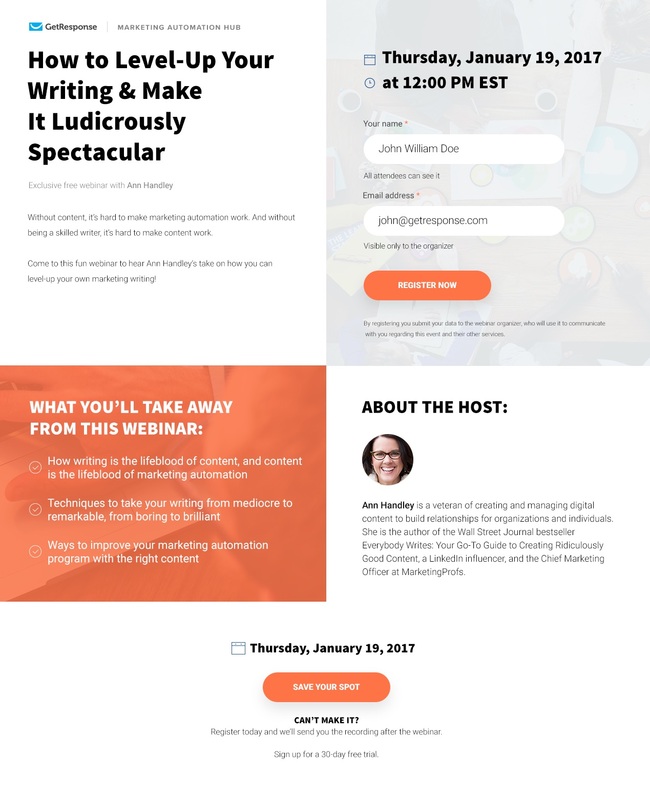 In this article, we’ve covered all the essential elements and shown great webinar invitation email examples. How: Motivate your audience to add the reminder into their calendar, so they won’t miss the date. In the meantime, while they’re waiting for the presentation, consider giving them something of value. Perhaps share the recording of your previous webinar, link to your article, or a free ebook on the topic. This will get them ready before they can join you live and maybe even inspire them to prepare some questions for the live Q&A session you should hold at the end of the presentation. How: Wait a few days, use a different subject line, and try inviting those users who haven’t opened your first invitation. Perhaps you’ve reached them at the wrong time so this email gives you another chance to convince them to show up to meeting. How: This is your last chance to increase the number of registrations. Use it wisely! Alter the copy, shorten it to make it easier to consume, and let them know it’s their last chance to sign up for the webinar. If they don’t make it, they’ll miss out on some great information, and perhaps chance to get a competitive edge over their competition. And if you think this is too much, consider this: for our last webinar How to use GetResponse Marketing Automation for your business, more than 53% of all registrations took place after sending the final reminder! 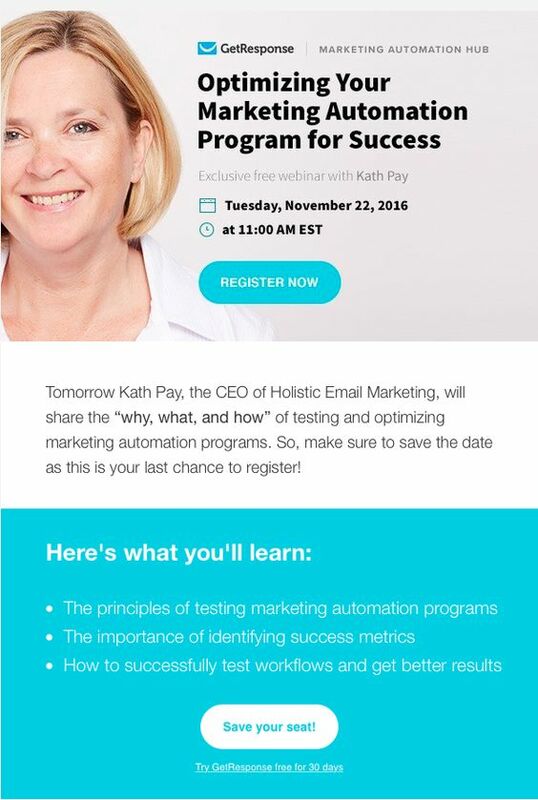 How: Send an automatic reminder to everyone who registered for the webinar. Give them the online room link, dial-in number, or webinar id they’ll need to join the meeting. Remind them how they should prepare for the event to make the most out of the webinar. How: Be charismatic. Use polls, engaging visuals such as videos, and leave time for a live Q&A. Make sure that there’s always someone available on the chat to answer the questions as you’re busy presenting. Sometimes the number of questions can be overwhelming, but you don’t want to miss that chance to connect with your audience! Ask for feedback and ideas for future webinars. Don’t forget to leave your contact details and useful links people might want to access after the presentation. 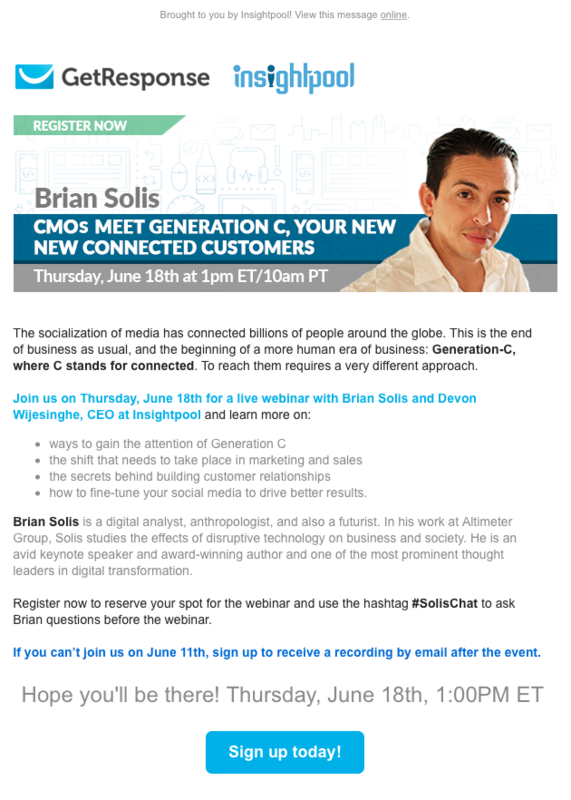 How: Thank your users for either registering or attending your webinar. If you’ve promised them the video recording, send them the link to your slides and your video. Add a short summary of what was covered during the presentation and invite them for other future events. If the webinar was product related, send an invitation for a quick demo to those who actually turned to the presentation, and have been tagged in your system as “engaged”. How: Use tagging and scoring throughout the whole process. Check who engaged in your communication, registered for the presentation, and turned up to the event. These are the engaged users you’ll want to pay closer attention to. Also look at the pages your users visited. If they checked out the pricing page, case studies, or schedule a demo, they are the hot leads whom you’ll want to quickly pass on to your Sales Team. Seeing what pages they’ve looked at will also equip your team with valuable information they can use on the call, making their claims more convincing. How: Look at the topic and questions that were raised during the webinar. Is there any other content your users might find valuable? Any articles or ebooks you’ve previously written? Or maybe you’ve just written a blog recap and gathered the answers to the top questions and want to promote it? Now’s your chance to follow up, stay in your users’ minds, and build closer relationships. 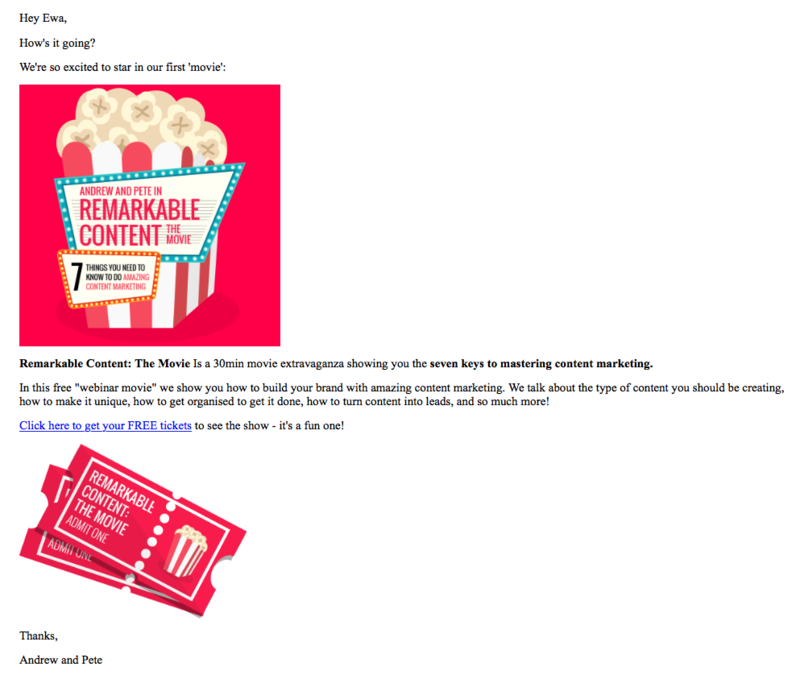 For more inspiration on what kind of messages you can automate, check out this article I’ve written before – 30+ automated emails you should be sending today. 3. Include it on high-traffic pages on your website. Another way to spike up the number of people registering for your webinar is to promote it on the pages that are getting you the highest amount of traffic – your homepage, blog, resources, FAQs, and so on. Use top-bars, pop-ups, or different forms of banners to capture your users’ attention. If your customers have a dedicated panel they use to log in, add the information about the upcoming webinar to the dashboard. Quick headline and an eye-catching visual should spark their interest and get them quickly on your landing page. If you don’t think all your users would benefit from the webinar – or simply don’t want them to know about it – make sure you present the information only to the selected group of people. Show it on the pages that are closely related to the topic of the webinar, or to the users who have visited a certain number of pages on your site. By focusing on the right segment, you’ll have a greater chance to increase your conversion rate! Consider who’s going to benefit the most from this webinar. Are these your blog readers? If so, write a teaser article in which you’re going to start the discussion on the topic of your choice. The chances are you’ve already integrated it well with your RSS so that all your blog subscribers will get the chance to find out about the webinar – in a perhaps subtler and more convincing way. I’m going to assume that you already know that on top of using emails and your own website, you should also promote your webinars across your social media channels. Create a queue of posts with a social media planning tool like Buffer or CoSchedule, post messages in the relevant groups you’re already participating in, and change the cover images so that anyone visiting your profile will quickly learn about the upcoming event. That’s what you can achieve without investing too much from your budget. But if want to increase your reach, you’ll want to secure some budget for paid advertising. Use Google AdWords, Facebook Ads, Twitter Ads, Pinterest Promoted Pins, and more to reach wider audience. If you want to do some more reading around this topic, I highly recommend these two articles – Is Facebook Advertising Really Worth It? and Beginners Guide to Social Media Advertising by Hootsuite. 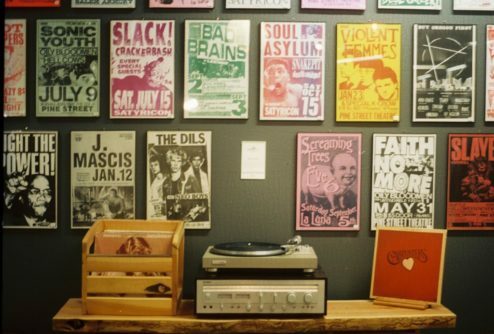 Just like with any other project or event, you don’t have to do everything on your own. In fact, your audience might like a fresher or slightly different perspective than your own, and hear a guest-speaker instead. In other words, from time to time, you should partner up with other brands to do a webinar together! This way you can not only divide the efforts of creating relevant and valuable content but also share the costs for promotion! If you’re not a fan of doing a webinar together with other brands, consider allocating some of your budget to promoting through your partners. They don’t have to take part in the content creation, but it won’t hurt you if the information about your presentation would reach the eyes of a larger audience. They could share the information about the event through banners, a dedicated blog post, or just feature it in their newsletter. Whatever you decide on can have a positive effect on your final number of registrations. There are other creative ways you can secure a higher number of registrations for your webinar. They are simple, subtle, and most of all – effective! What do I have in mind? One solution is to get your Sales and Customer Support Teams – the people who have the best and most frequent contact with your customers – to add info about the webinar into their email footer. A simple hyperlinked banner or a short PS-note can get you more engagement from the people who are already interested in your offer! Another way to get more registrations is to use teaser videos. A short invitation to the webinar could be included on your registration landing page or simply as a separate post on your social media channels. It will be easier to digest. If you’re a great speaker, you can show it even through a 30-second long video! As I said before, the key to running a successful webinar lies in three areas: planning, promotion, and practice. One can’t go without the other. So if you’re thinking of running an online presentation, give it some time to think about each of these elements. And if you’re worried you’ll get overwhelmed by the promotional process – remember, if you use marketing automation, your effort won’t be wasted. You can use the automated workflows for future campaigns, saving yourself time for other projects.